Gains in U.S stocks came to a halt yesterday as concerns rose among investors that the U.S.-Chinese trade dispute will intensify, while economic turmoil in Turkey and Argentina sent those countries’ currencies tumbling. 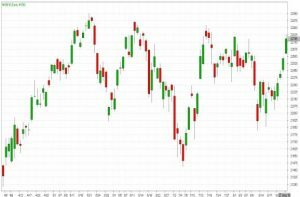 Stock markets and major government bond yields have risen in recent weeks on hopes that a global trade war can be averted, particularly with the leaders of the United States and Canada optimistic they could reach a new North American Free Trade Agreement (NAFTA) by today. Investor sentiment darkened, however, on the prospect that U.S. tariffs on an additional $200 billion worth of Chinese goods may likely take effect in late September. U.S. Treasury yields fell yesterday morning after a measure of underlying inflation hit the Federal Reserve’s 2 percent target for the third time this year. The Dow Jones Industrial Average fell 111.9 points, or 0.43 percent, the S&P 500 lost 8.55 points or 0.29 percent and the NASDAQ dropped 10.86 points, or 0.13 percent. The Dow Jones Industrial Average fell 0.53%. 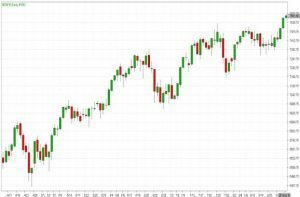 The best performers of the session on the Dow Jones Industrial Average were Apple Inc., which rose 0.92% or 2.05 points to trade at 225.03 at the close. Meanwhile, Walmart Inc. added 0.48% or 0.46 points to end at 96.10 and Verizon Communications Inc. was up 0.33% or 0.18 points to 54.75 in late trade. The worst performers of the session were Caterpillar Inc., which fell 1.97% or 2.80 points to trade at 139.06 at the close. Nike Inc. declined 1.68% or 1.39 points to end at 81.40 and Walgreens Boots Alliance Inc. was down 1.25% or 0.86 points to 67.80. The NASDAQ index declined 0.26%. The top performers on the NASDAQ were Bridgeline Digital Inc. which rose 53.40% to 1.3800, CPI Card Group Inc. which was up 38.52% to settle at 3.74 and Insys Therapeutics Inc. which gained 34.05% to close at 10.67. The worst performers were Cronos Group Inc. which was down 28.41% to 9.1200 in late trade, GreenPro Capital Corp which lost 20.49% to settle at 6.000000 and Kirklands Inc. which was down 18.78% to 9.34 at the close. Oil prices rose yesterday to the highest in more than a month, extending gains on growing evidence of disruptions to crude supply from Iran and Venezuela and after a fall in U.S crude inventories. U.S crude was 89 cents higher at $70.40, after earlier hitting a session high of $70.50. Both contracts were at their highest in more than one month. A rally that started earlier in the day accelerated as U.S crude rose above $70 a barrel, and more speculators entered the market. There are pretty good tailwinds here that will keep people jumping on board. Iranian crude exports are likely to drop to a little more than 2 million barrels per day (bpd) in August, against a peak of 3.1 million bpd in April, as importers bow to American pressure to cut orders. Crude exports from crisis-struck OPEC member Venezuela have also fallen sharply, halving in recent years to about 1 million bpd. 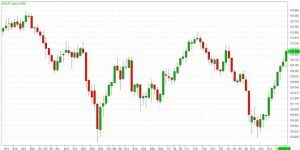 Official U.S oil inventory data on Wednesday also helped the bullish trend. U.S. commercial crude inventories fell by a larger than expected 2.6 million barrels. Gold slid below key support of $1,200 an ounce yesterday, undermined by a firmer dollar following strong U.S economic data. Spot gold lost 0.6 percent to $1,198.84 an ounce, while December U.S gold futures settled down $6.50, or 0.5 percent, at $1,205. Spot gold hit a six-day low of $1,195.95. Although we have quite a high conviction for higher prices in the medium and long term, we see a little bit of a challenge in the short term as long as the dollar remains strong. The dollar index gained against a basket of major currencies after U.S. consumer spending increased in July, making gold more expensive for buyers using other currencies. Even with all of the geopolitical and trade tensions, we’re still seeing good earnings by companies and that’s supporting higher equity markets too pressuring gold. Spot gold has been trading within an $8 range over the past two sessions, with investors keenly watching the psychological $1,200 level after the metal broke below that mark and hit a 1-1/2 year low of $1,159.96 early this month. The greenback’s strength against the yuan was making bullion expensive for buyers in the world’s biggest bullion consumer, China, yesterday. Gold investors also trimmed positions ahead of the long U.S. holiday weekend. While a relatively stronger Dollar and U.S economic growth are hurting the bullion’s appeal, concerns that Turkey’s financial crisis could spread may give the metal a reversal of fate. Spot silver fell 1.2 percent at $14.54 an ounce, earlier sliding to $14.47, a six-day low. Platinum lost 0.7 percent at $790.49 per ounce, while palladium was unchanged at percent at $965 after hitting its highest since June 19 at $983.75. Copper prices fell for the second straight session yesterday, with some investors still nervous about the impact of recent trade tensions on global growth. 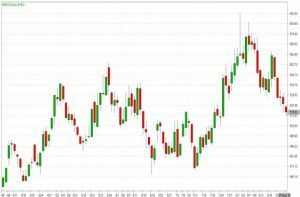 Wheat futures rose for a third consecutive session yesterday, adding to a steep rise the day before on concerns that Russia may curb exports after a drought pushed prices higher. Wheat closed up 4.4 percent on Wednesday. Soybeans and corn rose, but gains were limited by expectations of all-time high output in the United States. Soybeans were up 0.5 percent while corn also added 0.5 percent. The U.S. dollar rebounded against all of the major currencies yesterday with the exception of the Japanese Yen and its underperformance tells us that the dollar was driven higher by a reduction in risk. We can identify at least 3 reasons for the dollar’s decline today. First and foremost, stocks have retreated from their highs after hitting record-breaking levels every day this week and the sell-off prompted a recovery in the dollar. All of the good news this week encouraged investors to take on risk but with stocks retreating, currencies like euro, sterling and the Canadian dollars also came off their highs. 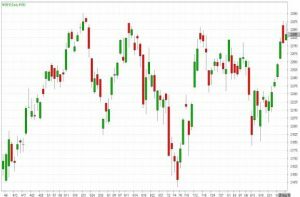 One of the main reasons for the pullback in equities and currencies is the end of the month profit taking but President Trump’s threat to withdraw from the WTO also did not help. Third, while this morning’s U.S. economic reports were mixed, economic data from other parts of the world were unambiguously disappointing leading to a weakness for those currencies. Today won’t be about data even though the Chicago PMI report and revisions to the University of Michigan’s Consumer Sentiment index is due for release. Month-end flows and updates on Brexit negotiations or Canada-US trade talks will drive currency movements. USD/JPY gave up all of yesterday’s gains but needs to close firmly below 111.00 to usher in a new wave of dollar weakness. Unlike some of the other major currencies, the slide in USD/JPY will be limited by the prospect of Fed tightening. The dollar could continue to rise against the euro. We’ve been talking about Italian bond yields all week and said yesterday’s pullback was unjustified. Today Italian yields shot up to fresh 4 year highs, driving the spread between Italian and German bond yields to their widest level in 5 years. Italy is the biggest problem for the euro right now and Fitch is scheduled to update their rating for Italy today. Sterling, on the other hand, should continue to outperform and will be an attractive long near 1.2950. UK mortgage approvals were lower than expected but the dollar’s recovery is the primary reason for the currency’s slide. The Canadian dollar sold off sharply on the back of a softer than expected GDP report. Growth stagnated in the month of June, causing the year over year rate to slip from 2.7% to 2.4%. The single currency fell as the Euro zone economic sentiment edged lower for an eight consecutive month in August, pulled down by less optimism in industry and services, a monthly survey by the European Commission showed. The Commission survey showed the economic sentiment indicator eased to 111.6 points in August. 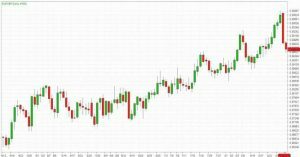 Overall, the EUR/USD traded with a low of 1.1640 and a high of 1.1716 before closing the day around 1.1669 in the New York session. The Japanese Yen has edged higher erasing the losses seen on Wednesday. On the release front, Japanese retail sales dropped to 1.8%, but still, beat the estimate of 1.5%. Later in the day, Japan releases Tokyo Core CPI, with a forecast of 0.8%. In the U.S, Core PCE Price Index edged up to 0.2%, while Personal Spending remained pegged at 0.4%. Overall, the USD/JPY traded with a low of 110.93 and a high of 111.73 before closing the day around 110.97 in the U.S session. The British Pound held near a four-week high as investors hesitated to take fresh positions on the currency amid a spate of crisscrossing Brexit headlines. Sterling surged more than one percent on Wednesday as traders covered short positions after the European Union’s Michel Barnier said that the UK could be offered an unprecedented partnership. Overall, the GBP/USD traded with a low of 1.2983 and a high of 1.3041 before closing the day at 1.3008 in the New York session. 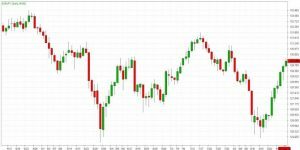 The Canadian Dollar fell as data showed the economy grew at a slower pace in the second quarter, supporting traders’ view the Bank of Canada will leave key interest rates on hold next week. Prices on domestic government debt rose in the wake of the latest gross domestic product figures, flattening the yield curve on the notion of slowing economic growth. Overall, USD/CAD traded with a low of 1.2901 and a high of 1.2998 before closing the day at 1.2979 in the New York session. 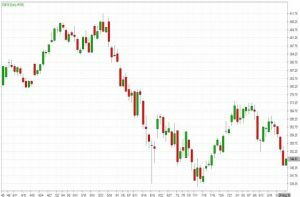 The Australian Dollar fell sharply yesterday after figures for capital expenditure and building approvals missed expectations, and the New Zealand dollar took a knock on business sentiment. The Australian Dollar weakened yesterday following the release of second-quarter capital expenditure which fell 2.5 per cent compared to the previous quarter. 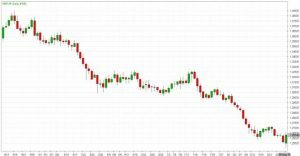 Overall, AUD/USD traded with a low of 0.7247 and a high of 0.7313 before closing the day at 0.7254 in the New York session. EUR/JPY is trading above 14, 50 and 100 days moving average. Fast stochastic is giving a bullish tone and MACD is also issuing a bullish stance. The Relative Strength Index is above 55 and lies above the neutral zone. In general, the pair has lost 0.93%. Currently, GBP/JPY is trading above 14, 50 and below 100 days moving average. Fast stochastic is issuing a bullish tone and MACD is also indicating a bullish stance. The Relative Strength Index is above 55 reading and lies above the neutral zone. On the whole, the pair has lost 0.74%. Currently, the cross is trading above 14 and below 50, 100 days moving average. Fast stochastic is giving a bearish tone and MACD is indicating a bullish stance. The Relative Strength Index is above 40 reading and lies below the neutral region. In general, the pair has lost 1.24%. This cross is currently trading above 14, 50 and 100 days moving average. Fast stochastic is indicating a bearish tone and MACD is also issuing a bearish signal. The Relative Strength Index is above 50 and lies above the neutral region. On the whole, the pair has lost 0.18%. This cross is trading below 14, 50 and 100 days moving average. Fast stochastic is issuing a bullish stance and MACD is indicating a bearish tone. The Relative Strength Index is above 33 and lies below the neutral region. In general, the pair has lost 0.26%. It has been a week of good news in the financial markets and the record-breaking levels in U.S. stocks tell us that investors are pleased with the recent developments. Particularly the fact that the U.S reached a trade deal with Mexico, talks with Canada are going well and the EU is willing to work with the UK. It remains to be seen whether these talks will turn into paper agreements but the hope that it will have enough to drive currencies and equities sharply higher. As long as the positive headlines continue to flow in, the risk rally should continue. USD/JPY is finally participating in the move thanks to a stronger Q2 GDP report. Economists were looking for growth to be revised lower but instead, it was revised up to 4.2% from 4.1%. Today’s personal income and personal spending reports should also be stronger as earnings and retail sales increased last month. Sterling was the best performer yesterday gaining more than 1% against all of the major currencies. According to the European Union’s Chief Brexit negotiator Barnier, the EU is ready to offer the UK a deal that it hasn’t had with any other country. 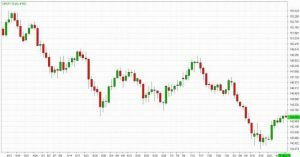 Coming hours after Brexit Secretary Dominic Raab complained about his availability for talks, the possibility of an unprecedented offer sent sterling sharply higher. 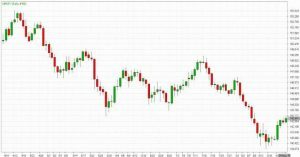 GBP/USD broke out of a 5-day long consolidation to trade above 1.30 while EUR/GBP experienced its strongest one day decline in more than 2 months. Raab is heading back to Brussels on Friday to the resume negotiations with the goal of reaching an agreement by November. This type of news is exactly what sterling traders have been waiting for. The Euro pulled back and it came off its highs to hit a low of 1.1650 but with all of the good news, EURUSD found itself back at 1.17. The rally occurred despite weaker German consumer confidence and softer French consumer spending. One of the worst performing currencies yesterday was the Australian dollar. The single currency was flat to lower yesterday, with peripheral markets outperforming on a pick-up in risk appetite after Canada’s plans to rejoin NAFTA talks eased concerns about global trade. The U.S., Canada a, d Mexico have until Friday to reach a deal to update the North America Free Trade Agreement. Overall, the EUR/USD traded with a low of 1.1650 and a high of 1.1708 before closing the day around 1.1706 in the New York session. The Japanese Yen traded lower against the U.S Dollar yesterday. On the release front, Japanese consumer confidence edged lower to 43.3, just below the estimate of 43.4 points. In the U.S, Preliminary GDP jumped 4.2%, beating the estimate of 4.1%. Pending Home Sales disappointed with a reading of -0.7%, well off the estimate of 0.3%. Overall, the USD/JPY traded with a low of 111.10 and a high of 111.80 before closing the day around 111.65 in the U.S session. 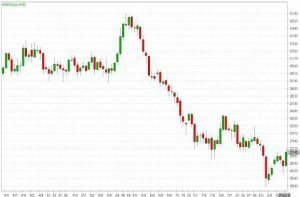 The British Pound surged against the U.S Dollar yesterday after an official from the European Union indicated that progress has been made in the Brexit negotiations. Michel Barnier, the EU’s chief Brexit negotiator, said Europe is prepared to offer an unprecedented partnership to the UK. The news had been positive for the currency. 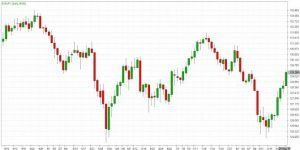 Overall, the GBP/USD traded with a low of 1.2843 and a high of 1.3030 before closing the day at 1.3023 in the New York session. The Canadian Dollar gained slightly against the U.S Dollar yesterday. Canada’s top trade negotiator praised Mexico’s trade concessions on autos and labor rights on Tuesday as she rejoined NAFTA talks, while U.S. lawmakers warned that a bilateral U.S.-Mexico trade deal would struggle to win approval in Congress. Overall, USD/CAD traded with a low of 1.2900 and a high of 1.2960 before closing the day at 1.2904 in the New York session. 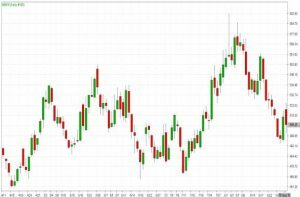 The Australian Dollar has fallen sharply in yesterday’s trading session in response to news that Westpac Bank, Australia’s second-largest lender, has hiked mortgage rates for both owner-occupier and investor borrowers. The bank cited a “sustained increase in wholesale funding costs” as the reason behind the out-of-cycle move. Overall, AUD/USD traded with a low of 0.7273 and a high of 0.7347 before closing the day at 0.7297 in the New York session. EUR/JPY is trading above 14, 50 and 100 days moving average. Fast stochastic is giving a bullish tone and MACD is also issuing a bullish stance. The Relative Strength Index is above 65 and lies above the neutral zone. In general, the pair has gained 0.55%. 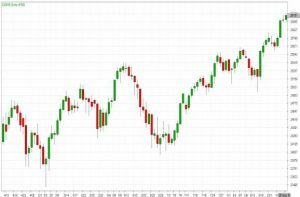 Currently, GBP/JPY is trading above 14, 50 and below 100 days moving average. Fast stochastic is issuing a bullish tone and MACD is also indicating a bullish stance. The Relative Strength Index is above 60 reading and lies above the neutral zone. On the whole, the pair has gained 1.64%. Currently, the cross is trading above 14 and below 50, 100 days moving average. Fast stochastic is giving a bullish tone and MACD is also indicating a bullish stance. The Relative Strength Index is above 49 reading and lies below the neutral region. In general, the pair has gained 0.06%. This cross is currently trading above 14, 50 and 100 days moving average. Fast stochastic is indicating a bearish tone and MACD is issuing a bullish signal. The Relative Strength Index is above 55 and lies above the neutral region. On the whole, the pair has lost 1.08%. This cross is trading below 14, 50 and 100 days moving average. Fast stochastic is issuing a bullish stance and MACD is indicating a bearish tone. The Relative Strength Index is above 34 and lies below the neutral region. In general, the pair has gained 0.58%. 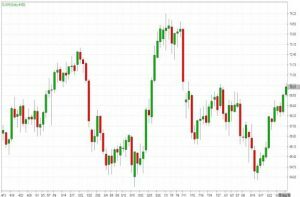 U.S stock index futures were little changed yesterday as investors stayed focused on trade, awaiting progress on talks between the United States and Canada and eyeing next week’s deadline for consultations on the next round of China-U.S tariffs. After the United States and Mexico announced a bilateral deal on Monday, U.S-Canada is working to salvage the North American Free Trade Agreement amid signs Ottawa was open to taking a more conciliatory approach. The next round of U.S tariffs on $200 billion worth of Chinese goods are expected to take effect in late September after a public comment period ends on Sept. 5. Investors will continue to concentrate on trade talks now with Canada and the enthusiasm will continue until we get some concrete news on whether or not the U.S. and Canada reach a deal. The benchmark S&P 500 index hit record highs over the last two days after strong gains on Friday following Federal Reserve Chairman Jerome Powell’s comments and then on the U.S-Mexico trade deal on Monday. 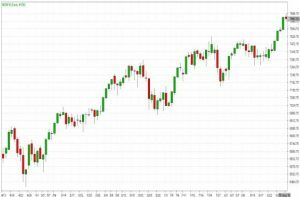 The Dow Jones Industrial Average gained 0.23% to hit a new 6-month high. 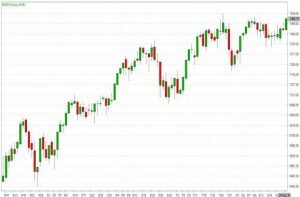 The biggest gainers of the session on the Dow Jones Industrial Average were Microsoft Corporation, which rose 1.60% or 1.76 points to trade at 112.02 at the close. Apple Inc. added 1.49% or 3.28 points to end at 222.98 and Visa Inc. was up 1.26% or 1.83 points to 147.03 in late trade. Biggest losers included Walgreens Boots Alliance Inc., which lost 0.89% or 0.62 points to trade at 68.66 in late trade. United Technologies Corporation declined 0.65% or 0.88 points to end at 133.62 and American Express Company shed 0.53% or 0.57 points to 106.71. The NASDAQ index gained 0.99%. The top performers on the NASDAQ were Opiant Pharmaceuticals Inc. which rose 37.64%, GreenPro Capital Corp which was up 30.11% to settle at 7.546000 and Sophiris Bio Inc which gained 24.61% to close at 3.190. The worst performers were Carver Bancorp Inc. which was down 14.46% to 4.850 in late trade, One Stop Systems Inc. which lost 11.53% to settle at 3.65 and ScanSource Inc. which was down 12.75% to 37.65 at the close. Oil prices rose about 1 percent yesterday, supported by a drawdown in U.S crude and gasoline stockpiles and on news of falling Iranian crude shipments as U.S sanctions deter buyers. U.S. crude was 77 cents higher at $69.30 a barrel. U.S crude inventories fell 2.6 million barrels last week, the Energy Information Administration said, exceeding the 686,000-barrel draw forecast by analysts polled by Reuters. U.S crude futures bounced briefly to $69.55, their highest in three weeks, on the inventory data before retreating. Increased gasoline demand was particularly supportive to the market given that crack spreads had been weak. Iran’s crude oil and condensate exports in August are set to drop below 70 million barrels for the first time since April 2017, preliminary trade flows data on Thomson Reuters show. Many crude buyers have already reduced orders from Iran, OPEC’s third-biggest producer, ahead of the Nov. 4 start date for U.S. sanctions. The reduction in Iranian exports implies global supply tightening. Gold climbed yesterday as funds bet prices would find short-term support at $1,200 per ounce, but a stronger dollar and expectations for increases in U.S interest rates limited gains. Spot gold was up 0.1 percent at $1,204.43 an ounce. Prices hit their highest since Aug. 10 at $1,214.28 on Tuesday but closed 0.8 percent lower as U.S. Treasuries rose after the United States and Mexico struck a trade deal. 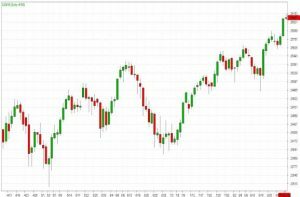 Analysts and traders are closely watching the psychologically important level of $1,200. Gold dipped below that this month for the first time since March 2017, giving it momentum to touch a low of $1,159.96. Gold is a tad higher now because we have managed to find support at $1,200 and that is attracting some intra-day bids at this stage. The market is more balanced than we have seen recently but we are still one spark short of a sustained rally here. Gold is still pinned down by a stronger dollar, which makes commodities it is priced in more expensive for holders of other currencies and can cap a rising gold market. The dollar rose as relief about a U.S.-Mexico trade deal gave way to concern among investors that the conflict over trade between the United States and China was not about to end soon. Adding to gold’s woes are expectations for further U.S. interest rate increases this year, record bets on prices falling and liquidations in exchange-traded funds (ETFs). There is still a lot of uncertainty and the monetary policy backdrop is not positive for gold prices. Higher rates would dent the appeal of non-interest yielding gold. Gold prices are on track to fall for the fifth straight month, which would make it the longest losing streak since early 2013. U.S. gold futures were down 0.3 percent at $1,210.60. Holdings in the largest gold-backed ETF, SPDR Gold Trust GLD, have declined 3.6 million ounces from a peak in late April. Spot silver was up 0.2 percent at $14.67. Copper drifted down yesterday, pressured by a recovery in the dollar and worries over softer demand from top consumer China. Wheat futures rose nearly 4 percent yesterday on technical buying and rumors that Russia might curb wheat exports. Soybeans and corn followed wheat higher. The U.S Dollar ended the session lower against some currencies and higher versus others, there’s no question that the sell-off is beginning to lose momentum. Consumer confidence beat expectations but higher interest rates caused house prices to rise less than anticipated and the stronger dollar contributed to the wider trade deficit. Revisions to second quarter GDP report is due for release today along with pending home sales but the dollar should take its cue from stocks, risk appetite and ultimately Canadian-US trade headlines. USD/JPY has been hovering above 111 since the beginning of the week. The only currency that has consistently performed worse than the dollar was the Japanese Yen and the only reason for that is the recovery in risk. If USD/JPY drops below 110.80, the next stop should be 110. In the past 2 weeks, we’ve seen a dramatic recovery in the euro. The single currency appreciated more than 4 cents in a move that took the pair from its 1-year low of 1.13 to a 3 week high of 1.1733. The recovery was driven by the decline in the U.S. dollar, improvement in risk appetite, softer U.S. economic reports, stronger German data and short covering. However, now that EUR/USD breached 1.17 and came within 17 pips of our 1.1750 target it may be time to start looking at selling euros. On a fundamental basis, the record-breaking moves in U.S stocks will boost business and consumer confidence. In fact according to the Conference Board, in August consumer sentiment hit its strongest level in 17 years. This positive attitude should translate into more spending especially after the confidence report showed more respondents preparing to make big-ticket purchases over the next 6 months. With more spending come more growth and healthier U.S. data. German data has also been decent as shown by German IFO report but the real problem for the euro is Italy. 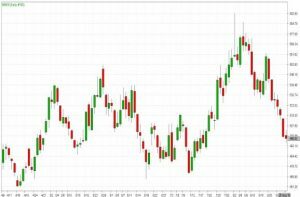 Italian 10-year bond yields hit 4-year highs yesterday reflecting renewed concerns about the country’s budget. Right now investors are looking at it as a localized problem as they’ve sold Italian bonds but not the euro. 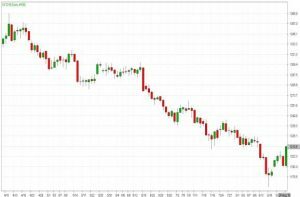 Sterling turned lower yesterday on the back of the recovery in the Dollar. The latest Brexit headlines also suggest that negotiations aren’t going as well as the UK hopes. Prime Minister May said a no deal Brexit is not the end the world. The single currency traded higher yesterday. Lending growth to euro zone companies and households held steady at a post-crisis high last month while an indicator of money circulating in the euro area, which often foreshadows future activity, slowed unexpectedly, the ECB said. Lending growth to non-financial corporations expanded by 4.1 percent in July. Overall, the EUR/USD traded with a low of 1.1661 and a high of 1.1732 before closing the day around 1.1693 in the New York session. The Japanese Yen traded little changed yesterday. On the release front, BoJ Core CPI edged up to 0.5%, above the estimate of 0.3%. In the U.S, manufacturing and consumer confidence data was stronger than expected. CB Consumer Confidence jumped to 133.4, crushing the estimate of 126.6 points. Today, Japan releases consumer confidence. Overall, the USD/JPY traded with a low of 110.93 and a high of 111.33 before closing the day around 111.17 in the U.S session. The British Pound was unchanged yesterday. U.S manufacturing and consumer confidence data was stronger than expected. CB Consumer Confidence jumped to 133.4. Today, the U.S publishes Preliminary GDP and Pending Home Sales. With the negotiations over Brexit stalled, there is an increasing likelihood of a ‘no deal’ Brexit. 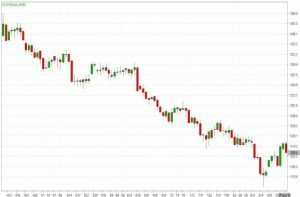 Overall, the GBP/USD traded with a low of 1.2859 and a high of 1.2930 before closing the day at 1.2870 in the New York session. The Canadian Dollar strengthened to a nearly three-month high on the prospect of Canada reaching a deal this week to overhaul the North American Free Trade Agreement. U.S. Treasury Secretary Steve Mnuchin said he believed the United States can reach a trade deal with Canada this week after coming to an agreement with Mexico. Overall, USD/CAD traded with a low of 1.2885 and a high of 1.2980 before closing the day at 1.2930 in the New York session. 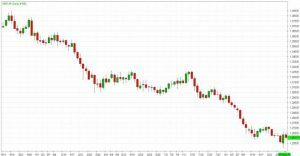 The Australian Dollar traded slightly lower. 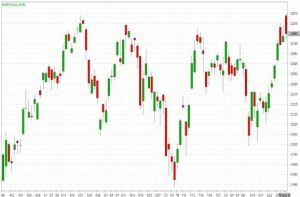 With the new Australian Prime Minister Scott Morrison having filled most of the cabinet roles, attention should turn back to economics, commodities and global investor sentiment as the main driver of AUD this week. 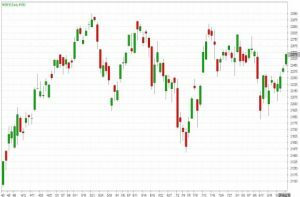 Research from Australian lender ANZ meanwhile suggests there is some evidence that businesses are reacting negatively to political uncertainty. 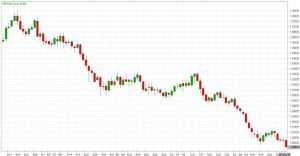 Overall, AUD/USD traded with a low of 0.7319 and a high of 0.7360 before closing the day at 0.7332 in the New York session. EUR/JPY is trading above 14, 50 and 100 days moving average. Fast stochastic is giving a bullish tone and MACD is also issuing a bullish stance. The Relative Strength Index is above 62 and lies above the neutral zone. In general, the pair has gained 0.24%. Currently, GBP/JPY is trading above 14 and below 50, 100 days moving average. Fast stochastic is issuing a bullish tone and MACD is also indicating a bullish stance. The Relative Strength Index is above 48 reading and lies below the neutral zone. On the whole, the pair has lost 0.07%. Currently, the cross is trading above 14 and below 50, 100 days moving average. Fast stochastic is giving a bullish tone and MACD is also indicating a bullish stance. The Relative Strength Index is above 51 reading and lies above the neutral region. In general, the pair has lost 0.07%. This cross is currently trading above 14, 50 and 100 days moving average. Fast stochastic is indicating a bullish tone and MACD is also issuing a bullish signal. The Relative Strength Index is above 73 and lies above the neutral region. On the whole, the pair has gained 0.29%. This cross is trading below 14, 50 and 100 days moving average. Fast stochastic is issuing a bearish stance and MACD is also indicating a bearish tone. The Relative Strength Index is above 22 and lies below the neutral region. In general, the pair has lost 0.51%. 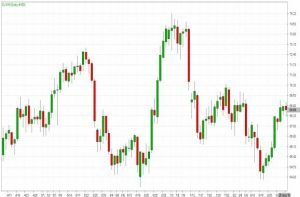 U.S stocks were little changed yesterday, with the benchmark S&P 500 and the NASDAQ hovering at all-time highs, a day after the United States and Mexico reached an agreement on an overhaul of the North America Free Trade Agreement (NAFTA). The two countries agreed on Monday to overhaul NAFTA and U.S. officials expressed optimism a deal could be reached this week. 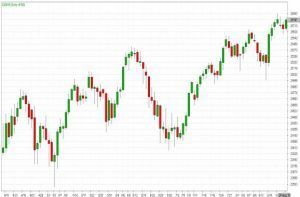 The benchmark S&P 500 and the NASDAQ indexes started the session strongly to hit fresh all-time highs, as they did on Monday after the trade deal was announced, before pulling back. After the initial surge to the top of the range you tend to get a little bit of a pullback. You catch people taking profits at the all-time highs. The Dow Jones Industrial Average was up 14.73 points, or 0.06 percent, the S&P 500 was down 1.00 points, or 0.03 percent and the NASDAQ was down 0.46 points, or 0.01 percent. Nine of the 11 major S&P 500 sectors were lower, though five of them were down less than 0.1 percent. The Dow Jones Industrial Average gained 0.06% to hit a new 6-months high. 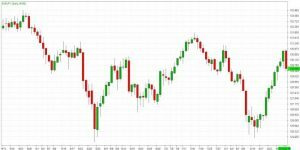 The best performers of the session on the Dow Jones Industrial Average were Walmart Inc., which rose 1.62% or 1.53 points to trade at 96.07 at the close. Meanwhile, Apple Inc. added 0.81% or 1.76 points to end at 219.70 and Cisco Systems Inc. was up 0.77% or 0.36 points to 46.95 in late trade. The worst performers of the session were Boeing Co, which fell 0.72% or 2.53 points to trade at 351.21 at the close. Coca-Cola Company declined 0.70% or 0.32 points to end at 45.37 and United Technologies Corporation was down 0.64% or 0.86 points to 134.50. The NASDAQ index climbed 0.15%. The top performers on the NASDAQ Composite were Affirmed NV which rose 246.88% to 5.550, Asta Funding Inc. which was up 31.58% to settle at 3.75 and Brooks Automation Inc. which gained 30.91% to close at 39.60. The worst performers were Akcea Therapeutics Inc. which was down 25.33% to 24.73 in late trade, Regulus Therapeutics Inc. which lost 19.56% to settle at 0.246 and Seven Stars Cloud Group Inc. which was down 18.18% to 4.050 at the close. Oil prices fell yesterday as some investors took profits on recent strong gains, but losses were limited the day after a U.S-Mexico trade agreement eased worries about tensions between the two countries. U.S West Texas Intermediate (WTI) crude futures fell 48 cents to $68.39 a barrel. Last week Brent marked a 5.6 percent gain, while WTI increased 4.3 percent. Market participants awaited industry data on U.S oil inventories that were expected to show a weekly drop in crude stocks. Official data is due today. Boosting market sentiment was news that the United States and Mexico agreed on Monday to overhaul the NAFTA. Canada’s top trade negotiator joins her Mexican and U.S. counterparts in Washington on Tuesday in a bid to remain part of the trilateral pact. Prices also drew support from findings of the monitoring committee of the Organization of the Petroleum Exporting Countries. Investors are more confident that supply should fall short of demand in the coming months. Gold turned negative yesterday as U.S Treasuries rose after the United States and Mexico struck a trade deal, with analysts saying ongoing U.S-China tensions would continue to weigh. 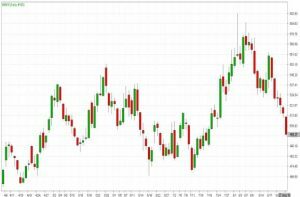 U.S Treasury yields rose across maturities to weekly highs as global trade war fears abated a day after the United States and Mexico reached agreement on an overhaul of the North American Free Trade Agreement (NAFTA). On the margin, it’s not much, but real rates rose and that took some of the wind out of gold sails. The easing of trade tensions prompted investors to reduce safe-haven positions in U.S. government debt. Sales of long-term Treasuries, in particular, pressured prices and drove yields up more at the long end of the curve, indicating bullishness about the economic outlook. Spot gold lost 0.4 percent to $1,206.39 per ounce, earlier touching $1,214.28, its highest level since Aug. 10. U.S. gold futures for December delivery settled down $1.60, or 0.1 percent, at $1,214.40 per ounce. Often purchased as a hedge against geopolitical risk, gold is highly sensitive to rising yields, because it pays no yield, yet costs to insure and store. In recent months, investors have sought safety from the trade disputes in U.S. Treasuries, which entails buying dollars. But a weaker U.S dollar kept gold supported yesterday, as it generally boosts demand for dollar-denominated commodities. The U.S.-Mexico deal pushed the dollar lower against a basket of major currencies as investors sought alternative assets and the greenback’s safe-haven appeal declined. The main trade dispute, meaning U.S.-China conflict, is still going on so this NAFTA deal is just a small aspect. Net short positions in COMEX gold contracts increased for a sixth straight week to a new record. Spot silver declined 0.2 percent to $14.82 an ounce, after hitting $14.99, a nearly two-week high, while platinum lost 1.1 percent to $790.74, after touching a two-week high of $810. 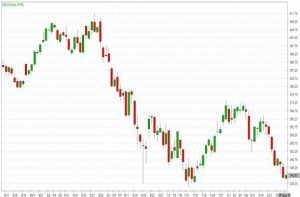 Traditional AgricultureCorn futures edged down yesterday to extend losses into a second session, with ample global supply keeping prices near their lowest in six weeks. Soybean prices have been weighed down amid an outbreak of African swine flu China that could threaten demand for animal feed. Stocks jumped yesterday as the United States and Mexico closed a new trade deal, potentially removing a source of uncertainty that had been plaguing investors for months. The Dow Jones Industrial Average rose 260 points as Caterpillar outperformed. The NASDAQ climbed 1 percent to an all-time high, breaking above 8,000 points for the first time, as Facebook, Amazon, Netflix and Alphabet rose. The S&P 500 gained 0.8 percent to hit a record high with materials and financials as the best-performing sectors. The market has been buffeted with a lot of headwinds lately, and the biggest one is trade. President Donald Trump said the deal would be called The United States-Mexico Trade agreement, leaving behind the 24-year-old NAFTA name. Trump added that the deal with Mexico is also very special for farmers and manufacturers. U.S. Trade Representative Robert Lighthizer said the deal must be approved by Congress before being implemented. Shares of Caterpillar and Boeing rose 2.8 percent and 1.3 percent, respectively. The Dow Jones Industrial Average added 1.01% to hit a new 6-month high. 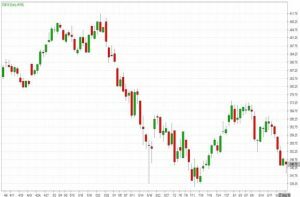 The best performers of the session on the Dow Jones Industrial Average were Goldman Sachs Group Inc., which rose 3.19% or 7.49 points to trade at 242.60 at the close. Meanwhile, Caterpillar Inc. added 2.77% or 3.83 points to end at 142.04 and DowDuPont Inc. was up 2.31% or 1.60 points to 70.81 in late trade. 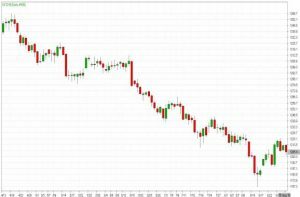 The worst performers of the session were Pfizer Inc., which fell 1.93% or 0.82 points to trade at 41.58 at the close. Walmart Inc. declined 0.43% or 0.41 points to end at 94.54 and Johnson & Johnson was down 0.10% or 0.13 points to 134.92. The NASDAQ index climbed 0.91%. The top performers on the NASDAQ Composite were ATA Inc. which rose 179.17% to 2.010, Egalet Corp which was up 35.59% to settle at 0.40 and AGM Group Holdings Inc Class A which gained 27.64% to close at 24.01. The worst performers were Eidos Therapeutics Inc. which was down 31.09% to 13.94 in late trade, Fuling Global Inc. which lost 12.50% to settle at 2.450 and Alliance MMA Inc. which was down 13.33% to 0.36 at the close. Oil prices edged up yesterday, supported by a strengthening equities market and news that the United States and Mexico agreed to overhaul the North American Free Trade Agreement (NAFTA). U.S West Texas Intermediate (WTI) crude futures gained 15 cents, or 0.2 percent, to close at $68.87 a barrel. Last week, WTI posted a 4.3 percent weekly gain while Brent marked a 5.6 percent weekly increase. Prices pulled back aftermarket intelligence firm Genscape reported that inventories at the Cushing, Oklahoma, and delivery hub for WTI rose by about 764,800 barrels from Aug. 21 through Friday. The United States and Mexico agreed on Monday to overhaul the North American Free Trade Agreement (NAFTA), putting pressure on Canada to agree to new terms on auto trade and dispute settlement rules to remain part of the three-nation pact. Prices have been buoyed in recent weeks by the view that the oil market will tighten when U.S. sanctions targeting OPEC member Iran’s oil exports kick in November. Gold gained above $1,200 per ounce yesterday as the Dollar weakened after the United States and Mexico struck an agreement that lowers trade tensions. Major currencies gained against the U.S. dollar, which has been a safe haven from months of trade tensions. Spot gold gained 0.3 percent at $1,208.92 per ounce, earlier peaking at $1,212.38, a two-week high. U.S gold futures for December delivery settled up $2.70, or 0.2 percent, at $1,216 per ounce. The dollar index slid against a basket of six major currencies. A weaker greenback makes dollar-denominated gold cheaper for holders of other currencies, which could boost bullion demand and prices. The NAFTA agreement is helping the platinum group metals a little bit. The United States and Mexico agreed to overhaul the North American Free Trade Agreement (NAFTA), putting pressure on Canada to agree to the new terms on auto trade and other issues to remain part of the three-nation pact. An agreement could ease concerns about an escalation in global trade tensions. But prices remained capped as higher rates, even if they come at a gradual pace, raise the opportunity cost of holding gold, which can be costly to store and insure. Our reading is that we still expect two more hikes this year and that should be the important thing near term for gold, next year the Fed is still likely to continue hiking. Gains in the Chinese Yuan yesterday made gold cheaper for buyers in the world’s biggest gold consumer, providing some support for prices. If prices hold at $1,200 an ounce, there is a good chance of further gains, with a target of $1,230/$1,235. Below $1,200, the bearish trend could recover strength, with a first targeted support area at $1,180. Higher activity in gold options amid geopolitical tensions and a record-long bull market for U.S equities suggest that investors are betting gold prices have found a floor. Meanwhile, spot silver gained 0.4 percent at $14.86 per ounce. Earlier it hit $14.92, its highest since Aug. 15. Traditional AgricultureSoybean and corn futures fell to six-week lows yesterday on expectations of large U.S crops and fears that hog disease in China might hurt demand for feed. Wheat futures also declined, sliding for a sixth session on lackluster demand for U.S supplies. 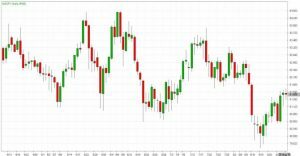 The U.S Dollar fell sharply against its rivals yesterday on fading fears over the prospect of a global trade war after the United States and Mexico reached a bilateral deal on NAFTA, paving the way for Canada to rejoin talks. The U.S Dollar index, which measures the greenback against a trade-weighted basket of six major currencies, fell by 0.47% to 94.63. President Donald Trump on Monday announced his administration had reached a deal with Mexico on issues that have upended the renegotiation of the North American Free Trade Agreement (NAFTA), the current trade agreement among the U.S., Canada and Mexico, for over a year. , Trump suggested the United States-Mexico Trade Agreement would replace NAFTA, paving the way for Canada to rejoin talks, bringing Trump a step closer to overhauling NAFTA and reducing investor fears over a full-blown trade war. Trump reportedly warned, however, that if a deal with Canada failed to materialized, then the U.S. would move ahead with tariffs on imported goods from Canada. This would dent the Loonie as it throws into doubt expectations about a September rate hike. By saying Canada could be left out, the US is threatening to take a tough line in those talks. The scenario poses uncertainty for Canadian economy, and could prompt Bank of Canada to hold off on a rate rise early next month. Fears over a full-blown trade war had kept demand for the greenback elevated on expectations that the strong U.S. economy would be less troubled from a trade war than that of its rivals. The dollar’s poor start the week comes as analysts warned that investor conviction for the greenback was starting to wane. Investors’ conviction in the strength of the dollar is starting to wane, including U.S. Federal Reserve Chairman Jerome Powell’s comments at Jackson Hole and recent developments in Washington. The plunge in the dollar was further compounded by strength in both euro and pound. EUR/USD rose 0.52% following better-than-expected business confidence in Germany, the Eurozone’s largest economy. 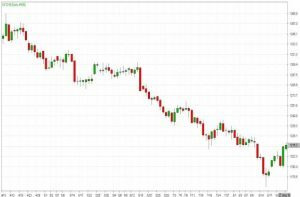 GBP/USD gained 0.31%, although gains in the pair were kept in checked by fears of a no-Brexit deal, which would see the U.K crash out of the European Union without a trade deal with the member bloc and would likely hurt the U.K economy. 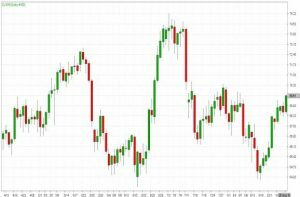 The single currency gained following the latest fundamental data from Germany, the largest economy within the Eurozone shows business morale improving finally this year. IFO had reported that August’s readings were improved across the board, with the current assessment coming in at 106.4, above the 105.4 expected. 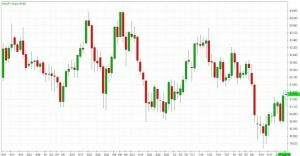 Overall, the EUR/USD traded with a low of 1.1593 and a high of 1.1692 before closing the day around 1.1676 in the New York session. 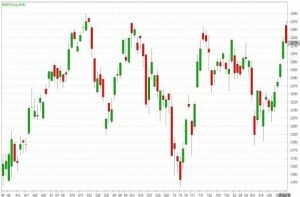 The Japanese Yen posted slight gains yesterday. It’s a quiet start to the week, with no Japanese or U.S events. Today, the U.S releases CB Consumer Confidence. Japanese inflation numbers in July were slightly softer than expected. National Core CPI remained pegged at 0.8%, shy of the estimate of 0.9%. The Services Producer Price Index edged lower to 1.1%. Overall, the USD/JPY traded with a low of 110.91 and a high of 111.32 before closing the day around 111.05 in the U.S session. 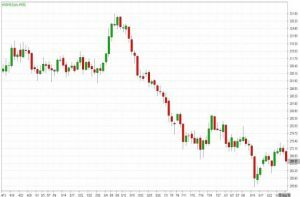 The British Pound traded higher at the start of the new week yesterday. 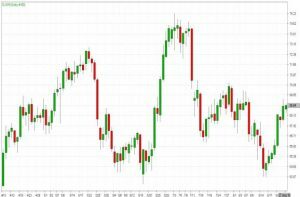 Despite the exchange rate recovering from earlier lows, there is a strong risk Sterling tests fresh lows over coming days as markets continue to factor a ‘no-deal’ Brexit. The Pound sold off close to year-long lows in the previous week. 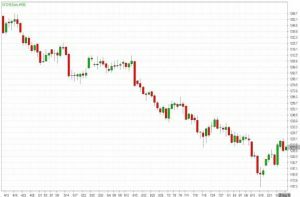 Overall, the GBP/USD traded with a low of 1.2827 and a high of 1.2899 before closing the day at 1.2891 in the New York session. 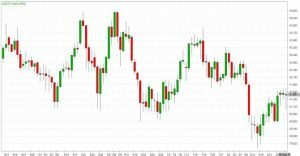 The Canadian Dollar reacted in a positive fashion to news of a breakthrough in NAFTA negotiations between the US and Mexico yesterday, August 27. According to reports, the United States and Mexico have reached an agreement to revise key portions of the 24-year-old North American Free Trade Agreement. Overall, USD/CAD traded with a low of 1.2951 and a high of 1.3065 before closing the day at 1.2965 in the New York session. 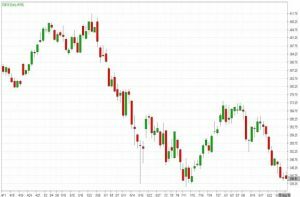 The Australian Dollar rallied on optimism that new PM Morrison would not seek to radically change economic policies. He is the 6th Prime Minister in 10 years. 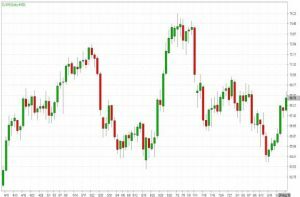 The markets actually reacted positively to the news, with the AUD gaining strength following Morrison’s victory. Morrison had served as the country’s treasurer for three years. 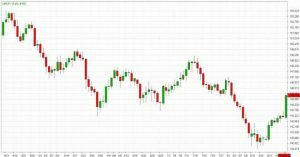 Overall, AUD/USD traded with a low of 0.7305 and a high of 0.7354 before closing the day at 0.7344 in the New York session. EUR/JPY is trading above 14, 50 and 100 days moving average. Fast stochastic is giving a bullish tone and MACD is also issuing a bullish stance. The Relative Strength Index is above 60 and lies above the neutral zone. In general, the pair has gained 0.31%. Currently, GBP/JPY is trading above 14 and below 50, 100 days moving average. Fast stochastic is issuing a bullish tone and MACD is also indicating a bullish stance. The Relative Strength Index is above 47 reading and lies below the neutral zone. On the whole, the pair has gained 0.18%. Currently, the cross is trading above 14 and below 50, 100 days moving average. Fast stochastic is giving a bullish tone and MACD is also indicating a bullish stance. The Relative Strength Index is above 50 reading and lies above the neutral region. In general, the pair has gained 0.13%. This cross is currently trading above 14, 50 and 100 days moving average. Fast stochastic is indicating a bullish tone and MACD is also issuing a bullish signal. The Relative Strength Index is above 70 and lies above the neutral region. On the whole, the pair has gained 0.10%. This cross is trading below 14, 50 and 100 days moving average. Fast stochastic is issuing a bearish stance and MACD is also indicating a bearish tone. The Relative Strength Index is above 28 and lies below the neutral region. In general, the pair has lost 0.02%. 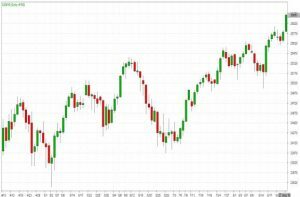 The Dow Jones Industrial Average added 0.52% on Friday. 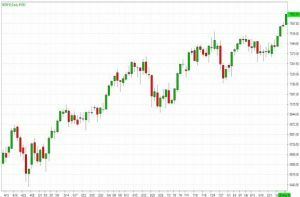 The best performers of the session on the Dow Jones Industrial Average were DowDuPont Inc., which rose 1.61% or 1.10 points to trade at 69.21 at the close. Meanwhile, Visa Inc. added 1.48% or 2.10 points to end at 144.20 and Intel Corporation was up 1.45% or 0.68 points to 47.66 in late trade. The worst performers of the session were Nike Inc., which fell 0.55% or 0.46 points to trade at 82.45 at the close. Goldman Sachs Group Inc. declined 0.52% or 1.23 points to end at 235.11 and Walmart Inc. was down 0.24% or 0.23 points to 94.95. The tech-heavy NASDAQ index climbed 0.86% on Friday. The top performers on the NASDAQ Composite were Alliance MMA Inc. which rose 110.32% to 0.42, Seven Stars Cloud Group Inc. which was up 38.97% to settle at 5.420 and Geron Corporation which gained 28.78% to close at 5.190. The worst performers were Hibbett Sports Inc. which was down 30.19% to 20.52 in late trade, China Biologic Products Inc. which lost 15.85% to settle at 84.91 and TMSR Holding Company Ltd which was down 15.59% to 4.06 at the close. Oil prices gained more than 1 percent on Friday, ending a run of weekly declines on signs that Iran sanctions may limit global supply and that a trade war may not curb China’s appetite for U.S crude. U.S crude was up 89 cents, or 1.3 percent, at $68.72. U.S crude rose more than 4 percent on the week, after seven consecutive declines, and Brent rose 5.3 percent after three weeks of falling prices. Concerns that an escalating trade war between China and the U.S. could slow economic growth and weigh on crude purchases eased slightly after sources told Reuters that China’s Unipec will resume purchases of U.S. crude oil in October, after a two-month halt due to the fight. Worries that Mexico’s incoming administration would not strike a bilateral agreement over NAFTA with the U.S. also weighed on the market, traders said. A dispute over opening up the oil and gas sector is weighing on the talks, Bloomberg reported, citing two people familiar with negotiations. Gold prices rose on Friday as the Dollar came under pressure from clues about the direction of U.S monetary policy from Federal Reserve Chairman Jerome Powell, which market watchers interpreted as dovish. The greenback weakened as Powell, speaking in Jackson Hole, Wyoming, said a gradual approach to raising rates remained appropriate to protect the U.S. economy and keep job growth as strong as possible with inflation under control. It sounds like the Fed is starting to lean a little bit dovish and that is taking the wind out of the U.S. dollar’s sail now. Spot gold had increased 1.8 percent to $1,206.14 an ounce, heading for a 1.9 percent weekly gain. U.S gold futures for December delivery settled up $19.30, or 1.6 percent, at $1,213.30 per ounce. U.S political uncertainty, heightened by the legal woes of two of U.S. President Donald Trump’s former advisers this week, is keeping the dollar under pressure despite tighter U.S. monetary policy, analysts say. A weaker U.S. currency makes dollar-denominated gold cheaper for holders of other currencies, which could boost demand and prices. A Reuters survey published on Thursday showed analysts expecting U.S. rates to rise twice more this year and twice next year. The Fed next meets over Sept. 25-26. Higher rates raise the opportunity cost of holding gold, which can be costly to store and insure. Investor appetite for gold has been in the doldrums in recent months. Rate hikes, low inflation, rising equity markets and a strong dollar have significantly diminished the appeal of gold. Last week’s data showed hedge funds and money managers raising their net short position for the sixth straight week to another record in the week to Aug. 14. Spot silver was up 2 percent at $14.76 an ounce, barely changed from last week’s close. Copper rose on Friday, clocking its first weekly gain in four on a softer dollar, though worries about Chinese demand are expected to cap gains as the country’s trade dispute with the United States drags on. Wheat futures dropped for the fifth consecutive session on Friday, touching a one-month low on sluggish export demand for U.S wheat despite tightening global supplies. Corn and soybean futures stabilized on Friday after sharp declines. Fed Chair Jerome Powell’s comments at Jackson Hole sent the U.S Dollar lower against all of the major currencies on Friday. Powell confirmed that further gradual tightening will be needed but investors were not impressed and instead focused on his comment that there’s no sign of inflation accelerating and no elevated risk of it overheating. This along with the Fed minutes which showed concerns about trade, housing and emerging markets casted doubt on a December. Every piece of U.S data released last week also deteriorated with durable goods, existing and new home sales falling. Revisions to Q2 GDP, personal income, spending, Chicago PMI and the trade balance are due for release this week but we don’t think they will help the Dollar. Looking ahead it’s the end of the summer in Europe and North America and the week before a major holiday in the U.S. Most of the major event risks are behind us and with minimal data on the calendar liquidity will truly subside. 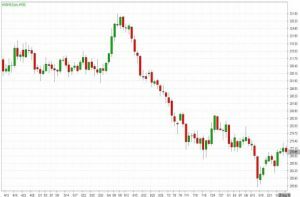 Euro climbed to its strongest level in 3 weeks. Despite the persistent rise in Italian yields, U.S Dollar flows and short covering has taken the pair sharply higher. Sterling also extended its recovery but the lackluster rally signals that investors are still worried about Brexit. They are skeptical of the recent progress and unhappy about the reports that the October deadline for a Brexit deal could be pushed out by 4 weeks. Nonetheless, Michel Barnier the EU’s Chief Brexit negotiator said negotiations have reached the final stage and they will hold continuous talks from here forward. Barnier’s eagerness to cooperate is a breath of fresh air but the Irish border and other issues are difficult ones and until real agreements are made, investors could refrain from buying the currency. There were no major economic reports released last week and nothing substantial on the calendar last week. Technically, GBP/USD is in a downtrend as long as it remains below 1.2950. The New Zealand and Canadian Dollars also extended higher. 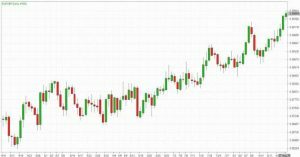 NZD was supported by this week’s stronger than expected second quarter retail sales and a smaller than anticipated trade deficit but the data isn’t great because the annual trade deficit hit its largest level since March 2009. Dairy prices also fell further, which could reduce the value of dairy exports going forward. Central Bank Governor Orr said this past week their biggest challenge is getting inflation to rise and they haven’t ruled out cutting interest rates to achieve its target. Even if NZD/USD continues to recover, it may find it difficult to rise above the July high of .6860. The single currency has been somewhat noisy during the session but in a good way. The market had beaten this currency down but it seems like fears about the Turkish lira and contagion are starting to drop off a bit. That’s a good sign, and it seems as if the attitude of traders around the world is the step back a bit. 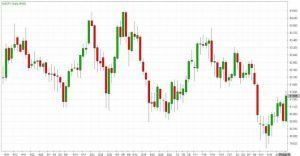 Overall, the EUR/USD traded with a low of 1.1533 and a high of 1.1638 before closing the day around 1.1623 in the New York session. The Japanese Yen pair retreated further from 2-week highs amid a US dollar sell-off following Fed’s Powell speech at Jackson Hole. Earlier rose to 111.48, the strongest level since August 6 and recently printed a fresh daily low at 111.10. It was hovering near the lows, with the intraday bias pointing to the downside. Overall, the USD/JPY traded with a low of 111.08 and a high of 111.46 before closing the day around 111.25 in the U.S session. The British Pound has reversed direction on Friday and posted gains. In North American trade, GBP/USD is trading at 1.2845, up 0.26% on the day. On the release front, the number of mortgages approved by major UK banks dropped to 39.6 thousand, shy of the estimate of 40.6 thousand. Brexit continues to hover over the British economy like a dark cloud. 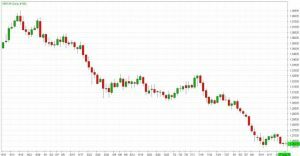 Overall, the GBP/USD traded with a low of 1.2797 and a high of 1.2879 before closing the day at 1.2849 in the New York session. The Canadian Dollar strengthened on Friday, recovering from an earlier one-week low as oil prices rose and a speech by Fed Chairman Jerome Powell helped boost stocks and weaken the greenback. Powell outlined a steady, surprise-free course for monetary policy in a speech at the annual central banker’s symposium in Jackson Hole, Wyoming. 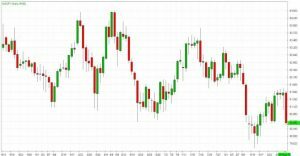 Overall, USD/CAD traded with a low of 1.3008 and a high of 1.3101 before closing the day at 1.3035 in the New York session. 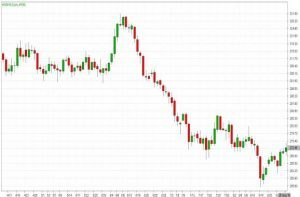 The Australian Dollar got a little boost at the end of the week as its home country got a new Prime Minister, but AUD/USD remains severely battered and, indeed, at lows not seen since the start of 2016. Former Treasurer Scott Morrison has replaced Malcolm Turnbull as leader of the Liberal Party which governs in a coalition. Turnbull lost the confidence of his party so Morrison becomes Australia’s sixth Prime Minister since 2007. 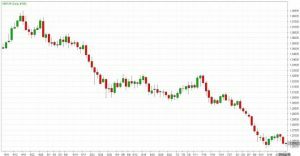 Overall, AUD/USD traded with a low of 0.7236 and a high of 0.7342 before closing the day at 0.7327 in the New York session. EUR/JPY is trading above 14, 50 and 100 days moving average. Fast stochastic is giving a bullish tone and MACD is also issuing a bullish stance. The Relative Strength Index is above 57 and lies above the neutral zone. In general, the pair has gained 0.71%. Currently, GBP/JPY is trading above 14 and below 50, 100 days moving average. Fast stochastic is issuing a bullish tone and MACD is also indicating a bullish stance. The Relative Strength Index is above 45 reading and lies below the neutral zone. On the whole, the pair has gained 0.27%. Currently, the cross is trading above 14 and below 50, 100 days moving average. Fast stochastic is giving a bullish tone and MACD is also indicating a bullish stance. The Relative Strength Index is above 49 reading and lies below the neutral region. In general, the pair has gained 1.09%. This cross is currently trading above 14, 50 and 100 days moving average. Fast stochastic is indicating a bullish tone and MACD is also issuing a bullish signal. The Relative Strength Index is above 70 and lies above the neutral region. On the whole, the pair has gained 0.46%. This cross is trading below 14, 50 and 100 days moving average. Fast stochastic is issuing a bearish stance and MACD is also indicating a bearish tone. The Relative Strength Index is above 27 and lies below the neutral region. In general, the pair has gained 0.01%.